Luckily, for the outdoor adventurist, there are plenty of great options when it comes to tactical flashlights and you only need to give it a thought to decide which one to go with. A good tactical flashlight is typical compact and not necessarily small as this may be related to your hands also. You want to have a good grip on the flashlight and you definitely want it to be easy to carry and highly portable. The body should be made with heavy-duty materials and able to take a fall or two. Many models out there come with adjustable lighting and you want this feature also as your needs are so various in tactical missions. A good tactical flashlight isn’t just easy to operate, but also able to help you go through the lighting modes fast and easy. Some brands have managed to create good, reliable, portable and rugged tactical flashlights that handle the challenges of the tactical experiences. Scroll down to take a look at some of their best results and don’t try to give them a chance when in need. 1). 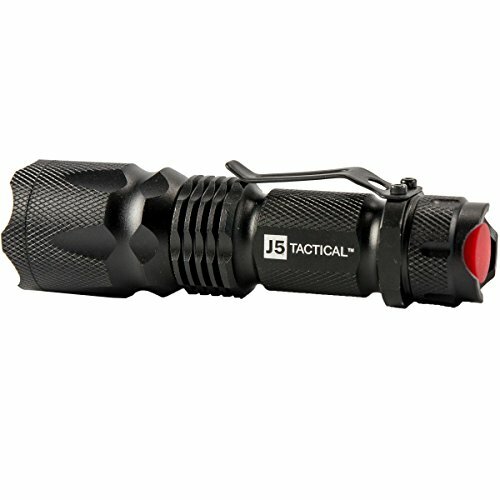 J5 Tactical is one of the most popular and reliable brands out there when it comes to tactical flashlights. J5 Tactical flashlights are rugged and build for the tactical jobs and their lighting performances don’t disappoint in most cases. One of the most representative tactical flashlights from J5 and by far the most popular out there, the J5 Tactical V1-PRO Flashlight – The Original 300 Lumen Ultra Bright, LED Mini 3 Mode Flashlight is everything a tactical flashlight needs to be: small, tough and reliable. The J5 V1-Pro is not only small and good for the tactical mission, but also comes for a very good price. It has a 300 lumens maximum output and its light travels quite far considering its size: up to 600ft. as any good tactical flashlight should have, this one also has three lighting modes that go great in certain situations. From the low to the high mode or the strobe one in the emergencies, the flashlight one dependable little tool to have around in the outdoors. If you want more light, never forget about the focus slide of the flashlight. The J5 V1-Pro is also a versatile choice and you may use AA battery or one rechargeable 14500 battery. You’re going to be noticing how the flashlight doesn’t eat up batteries, which is always a good news. The build of the flashlight recommends it for the tactical jobs and this one is good to take when hiking, camping or going on a tactical mission. Even though it’s water resistant, try not to take it when diving. Easy to hold and to store due to its compact shape, the flashlight feels comfortable in any hand and has a good grip. It’s highly portable as it features a metal belt clip and you may even hold it in your mouth, for a hand free operation. On top of everything else, the flashlight has just the right weight for a good carry and hold. As for the price, it’s hard to say no to also. 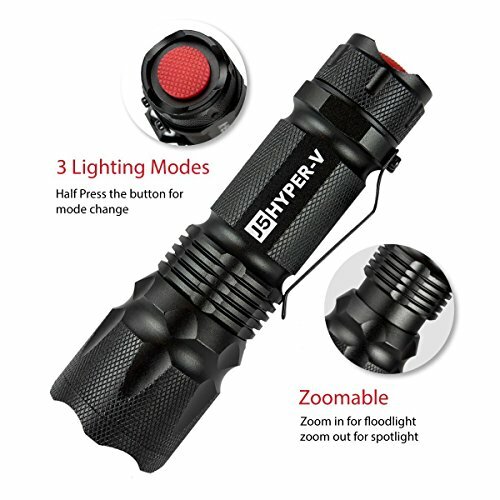 Despite the minor issues, for the good build, performances and so many other good things the flashlight is one you should buy without even blinking when in need. 2). Even though it’s not as popular as its previous model, the J5 Hyper V Tactical Flashlight – Amazingly Bright 400 Lumen LED 3 Mode Tactical Flashlight is just as good and reliable as the J5 V1 Pro. The flashlight has a maximum output of 400 Lumens and is small and easy to carry around. The lighting modes are easy to use and you may set the flashlight on high/low or strobe mode, depending on a tactical situation. The focus is adjustable and you may also zoom the beam in and out for a more focused narrow beam. The J5 Hyper V is one rugged flashlight and its compact ensures an easy use and carry. Whether you’re out on a tactical job or fishing with some friends, the flashlight is dependable and easy to use. It has an aluminum alloy case so the flashlight handles a fall or two. Easily fitting in any pocket, the flashlight comes with a clip that is tight and secures the flashlight. As for the power, the J5 Hyper V runs on three AAA batteries, which are cheap and very easy to find. When using the bright mode, the batteries should hold for a good amount of time. Easy to operate even with one hand, the flashlight has a good and comfortable grip and it’s a sure choice for the tactical missions. All in all, for a good price, you get a dependable, tough and compact flashlight from J5 Tactical that does deliver on so many tactical missions. A well-known brand of tactical flashlights out there is Streamlight that seems to have been finding the secrets when designing both the tactical and the weapon mount tactical flashlights. 3). 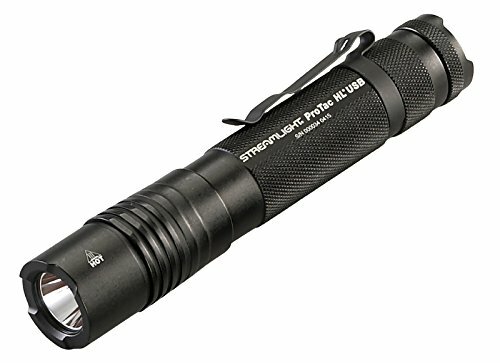 One of its most popular models out there, the Streamlight 88052 ProTac HL USB 850 Lumen Professional Tactical Flashlight that is both tough and easy to use. The flashlight is made with high quality materials and is one of the toughest out there. It has three lighting modes that fit specific situations. Its light is very bright and the maximum output is 850 Lumens. You may use the zoom function when in need and don’t hesitate to rely on the strobe mode if the situation requires it so. The flashlight has a wide range and it’s user friendly. It has a switch design so it’s not difficult to use it. The tough body makes it reliable for the tactical missions and its IPX4 waterproof grade means it can sure take more than a splash. Unlike other tactical flashlight, this one has a long, slim profile but this is a great thing, especially when you’re trying to get in the narrow spaces. The belt clip is strong so you may have the flashlight at reach in any moment. Let’s not forget the anti-roll ridges that provide good and sturdy grip at all time. The flashlight is well made and compact so it meets most expectations you’d have from a tactical flashlight. Cons or no cons, the flashlight still is a dependable and tough flashlight that satisfies so many out there. 4). In case the first model didn’t help you decide, maybe this one is going to do the trick. 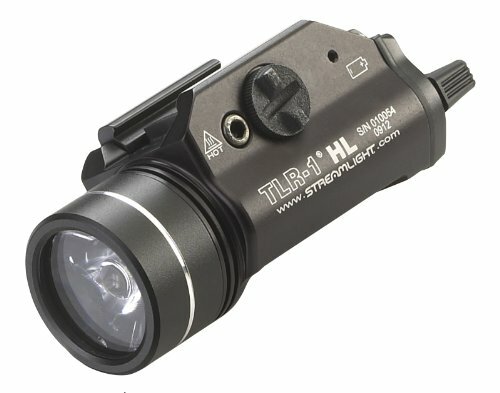 The Streamlight 69260 TLR-1 HL Weapon Mount Tactical Flashlight Light 800 Lumens with Strobe is one popular flashlight that you may use on many weapons, but does stand out on a Glock 19. The flashlight gives no less than 12,000-candela peak beam intensity and it’s maximum output of 800Lumens is a lot even for the user, not only for the one you’re attaching. The flashlight has a smart design and interface and the Snap-on feature lets you easily operate it with just one hand. You may also keep your hands away from muzzle when you’re attaching the flashlight so you get to do something else. After all, you may never need when you need an extra hand while on a tactical job, right? Designed and build for the tactical jobs, the flashlight easily takes a fall and its aircraft aluminum body makes it tough and durable. The same thing goes for the anodized finish with high temperature so the flashlight is made for the outdoors. As for the glass lens, it’s good to know it’s shock-mounted which adds up on the list of tough features of the flashlight. The list of great features continues with the ambidextrous momentary/steady on/off switch and the double tap momentary paddle that make the operation so easy. It’s also very easy to enable/disable the strobe mode. The battery door is tethered and the flashlight comes with latch mechanism so it’s easy and safe to change the battery when in need. The beam is concentrated due to the TIR optic and the peripheral illumination is high. The wide beam patterns, the wide range, and the focused beam are important to mention about the flashlight’s performances. Build to use from -40 to 120F degrees and presenting an IPX7 waterproof grade, the flashlight is one tool that doesn’t let you down when out on the mission. You may even submerse it to 1 meter for 30 minutes or so. The flashlight is also versatile and you may use it for a nice variety of weapons: S&W99, S&WTSW, Glocks, Picatinny, and Beretta 90two. For what is worth, the flashlight still makes a very good example on how Streamlight tactical flashlights are dependable, tough and ready for the tactical jobs. 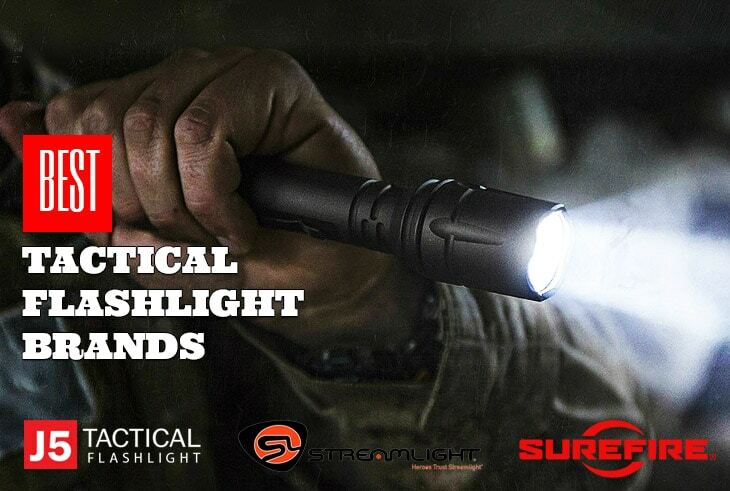 Another good brand that doesn’t disappoint when it comes to flashlights and tactical ones as well is Surefire. 5). Popular and reliable, the SureFire G2X Series LED Flashlight is a very good example on how Surefire knows its job when it efire.ow Streamlight tactical flashlights are dependable, tough andcomes to the good tactical flashlights. Made with tough Nitrolon polymer and Mil-Spec hard-anodized bezel, the flashlight is durable and able to take a beat for a long time. Its tough polycarbonate window handles a fall, whereas the waterproof O-ring and the sealed gasket increase its ability to take the outdoor jobs. Additionally, the flashlight has a wide temperature tolerance and has a reliable fault (short-circuit) protection and a built-in heat protection as well. The flashlight has two output levels and its maximum is 320 lumens, whereas the minimal 15 lumens helps the flashlight run for longer time. The beam is good thanks to the parabolic reflector and the flashlight has a very good range and cover. The flashlight has a dual-output tail cap click switch that makes the use fast and easy. The design is comfortable and the flashlight leaves a nice feel in the hand. Its compact shape and small size ensures easy use every time and easy store as well. For the tough build, ease of use and storage, the flashlight still is a good and dependable choice for many tactical missions. 6). 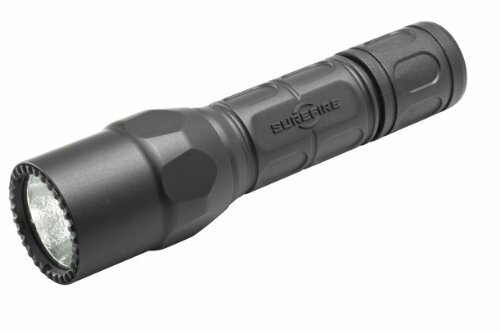 Even though it only has two output levels, the SureFire P2X Fury Dual-Output LED Flashlight with anodized aluminum body is still a good example on how Surefire designs and builds reliable tactical flashlights. Rugged and small, the flashlight comes with a durable LED emitter so it’s supposed to provide maximum light output and runtime. The minimum output is 15 lumens, whereas the maximum one is 600 lumens, but the minimum output is enough if having batteries is more important. The dual output tail cap click switch has a lockout so the risk for accidental activation is minimal. 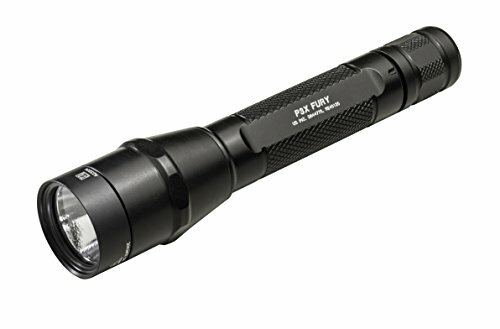 The beam is good due to the micro-textured reflector and the flashlight is tough as its body is made with aerospace aluminum. The Mil-Spec hard-anodized body helps the flashlight take the use for quite some time. The tempered window is coated so the entire flashlight is able to take an impact. The O-ring is weatherproof and the gasket is sealed, so there are many features that extend the lifespan of the flashlight. The flashlight has a knurled design so the grip is sturdy and comfortable. It feels lightweight and it’s easy to use. Whether you put it in your pocket or in your hand, the flashlight is easy to carry and to use. Never mind the cons though as, for the tough build, reliability and ease of use, the flashlight is worth every single penny.